“Putting these systems on a ship wasn’t the first option that came to mind,” said Kendall, the Under Secretary of Defense for Acquisition Technology and Logistics. He said time is the most challenging aspect of destroying the weapons at sea. The crew will have 90 days to neutralize an expected 700 metric tons of chemical mustard gas and DF compound, the precursor to sarin nerve gas. Capt. Rick Jordan, 40, a sailing veteran who works for Keystone Shipping, is contracted under the Maritime Administration to captain the Cape Ray and its crew of 35. A security contingent and a 63-member chemical destruction team will also be on board. “Far and away weather is our single biggest obstacle on this trip,” the captain said. He said any production will be shut down in heavy seas. Adam Baker, a chemical engineer who worked on the FHDS, described it is a unique venture. “This has not been done on this particular platform. It has not been done at sea,” he said. Baker, from the US Army’s Edgewood Chemical Biological Center (ECBC), said the operation involves “taking the established operations that we’ve done at several land sites domestically and internationally, and applying them here” on a sea-faring motor vessel. “This system is designed specifically for bulk liquid chemical agent,” rather than active warheads, Baker said. 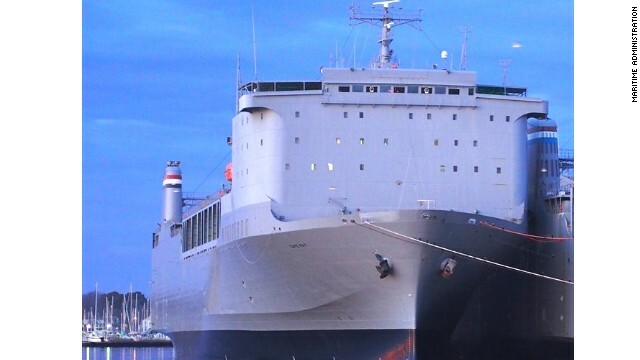 The plan to rid Syria of chemical weapons, in conjunction with the UN’s Organization for the Prohibition of Chemical Weapons (OPCW), involves the transport of chemical weapons in safe containers to the Syrian port of Latakia. Each FDHS system on the Cape Ray is housed inside a white environmental enclosure, and those enclosures are enveloped in a larger enclosure, all ventilated through carbon filtration systems. Two FDHS systems running concurrently are capable of neutralizing 130 gallons of chemical weapons material in two hours, according to Baker. It’s up to the OPCW to find a facility for safe Drano disposal. What does it say that we have a ship readily available that can go out to sea and destroy chemical weapons at the drop of a hat . It says this world is messed up . "It’s up to the OPCW to find a facility for safe Drano disposal." Don't forget about iraq. Its about to turn. – Al-assad still killing innocent Syrian child. – Maliki another dictator killing innocent Iraqi people in Alanbar stat and naming them Al-qadeh. – Terrorist group of Hezbolah with helping of regime of Iran moving the sky D ballistic rockets from Syria to the Lebanon. – USA closing eyes and begging dictator regime of Iran not make the nuclear bomb. Let's all hope Syria pays the bill on time!!! It seems by my math if we alone were responsible for neutralizing those 1.5 million gallons it would take that ship 2.6 years or 961 days if all they can do is 130 gallons in two hours. They will not get it done in 90 days. Go home john you're drunk. So 1.5m gallons is the waste. What you dont know is how many gallons it takes to make 700 metric tons of chemical mustard gas and DF compound. The process is sure to add some amount of product to the waste to render it neutral. Not saying the math works if you do it right, saying you can't do the math because you dont know the variables. Rather than collectively washing our hands with "That is a syrian responsibility" Lets see what we can do to encourage success on the parts they alone are in charge of. Disposing of this stuff is more important than anything else you can be trying to make happen. Assad asked for armored transports , we said no, now you try to wash your hands of that part of it which I see as setting this up for failure.